A night bell is a relic of another time, something you read about in a James Herriot story. 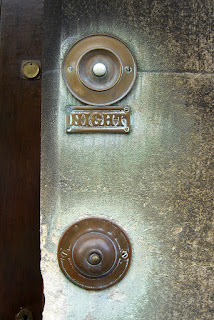 I saw this one, along with its sister, the day bell, on the door of a doctor's office in Winchcombe, England. Is the night bell still used, in these days of cell phones, emails and text messages? I admired the lettering and the patination of both doorbells and noticed the white button on the night bell. So many trembling hands had reached out in dim light to press that bell, worried, panicky, praying that the doctor would respond quickly. What stories that bell could tell if it could do more than just ring.